Will the Catalan independence movement couple its calls for self-determination with demands for socialism? After years of separatist agitation, Catalonia held its most important regional election in recent history on September 27. Preceded by four mass rallies — each assembly hundreds of thousands — and a symbolic referendum in 2014, the Catalan regional government called a snap election with the unequivocal goal of transforming it into a covered, full-fledged plebiscite. Due to the Spanish government’s opposition to any political solution or referendum, the Catalan government, together with the separatist political parties and organizations, found this mechanism the most valuable one to measure the support for an independent Catalonia. The momentum of Catalan separatism has been fueled not only by the economic crisis in Spain, but also by the cumulating political frustration among reformist-federalist partisans. Catalonia, an autonomous political entity in decentralized Spain, has over the years aspired to greater levels of self-governance. Accordingly, in 2005 the center-left coalition in power prepared and approved a new constitution granting something like federal status to Catalonia. However, this federalist constitution did not survive its debate in the Spanish congress, and was notably diminished in its final version of 2006. Later in 2010, the Spanish Constitutional Court ruled against several crucial articles on the role of Catalan language, justice, and taxes, thus killing any federalist aspiration in the now-mutilated Catalan constitution. The rise of massive support for an independent Catalonia began at this point. Usually stuck between 15 and 20 percent, public backing for Catalan secession began to increase in 2010 to 25 to 30 percent. In the September 27 plebiscite, it hit 48 percent. The Spanish left, and the global left more generally, has observed with suspicion the rise of Catalan separatism, seeing it as a bourgeois, nationalist, divisive phenomenon. Even though the Left is sympathetic to the right of self-determination in principle, many distrust not only the corrupt and neoliberal leadership of Catalan separatist forces — as epitomized by the figure of Catalan president Artur Mas — but also feel that this will create more divisions for the popular classes and undermine the promising rise of Podemos. Boaz Vilallonga, a modern intellectual European historian, teacher, visiting scholar at New York University, and op-ed contributor to the Catalan newspaper Diari Ara, is less skeptical. Jacobin spoke to him in early October, soon after the referendum, to get his thoughts about where the Left should stand on Catalan independence. What was the stance of leftist forces with regards to the September 27 plebiscite? The coalition of leftist forces known as Catalunya Sí Que Es Pot (Catalonia, Yes You Can) have been campaigning strictly on social issues and has avoided a “yes” or “no” stance, while theoretically remaining supportive of a referendum of self-determination. This formation groups the old leftist coalition of Iniciativa per Catalunya-Verds (ICV) — socialists, Eurocommunists, and environmentalists — with Podemos. They suffered a painful defeat. In 2012’s regional election — before the rise of Podemos — ICV obtained thirteen members of parliament (MPs) and 9.89 percent of the vote, which translates to almost 359,000 votes. In 2015, the coalition with Podemos won eleven seats in the parliament and 8.94 percent of the vote, around 366,000 votes. The Podemos phenomenon and its ambivalent message on Catalan secession has not been able to capture a Catalan electorate in the midst of separatist momentum. In my mind, however, the real leftist phenomenon in Catalonia is Candidatura d’Unitat Popular (Candidacy of Popular Unity, CUP). Born in 1986 as a platform for a constellation of Catalan parties and organizations in the separatist left, CUP was formed through a hybridization of socialism and radical separatism (which they call “national liberation”). In last month’s plebiscite, CUP obtained its best results so far, with ten MPs and 8.2 percent of the vote, which represents more than 336,000 votes. By comparison, in the 2012 election, when CUP had obtained its first parliamentary representation, they only won three seats with 3.48 percent (126,000 votes). In the span of just three years the CUP tripled its support. Readers might be a bit unfamiliar with those terms. Legally, what is known as “Catalonia” refers to a northeast region in Spain, with Barcelona as its capital, and with an autonomous, devolved government and parliament. Historically, “Catalonia” included what is now known as “Département des Pyrénées-Orientales,” in France, with Perpignan as its capital. This French county is also known as “Northern Catalonia” and it was ceded by the Spanish monarchy to the French crown in 1659. Catalan language and culture are also a constitutive part of Valencia, the Balearic Islands, some Aragonese counties, the independent country of Andorra, and the Italian city of Alghero. This geographical area is what is known as the Catalan Countries. Even though the main object of Catalonian secession, as it is understood today, is the region within Spain, radical separatism expects to create a new nation-state comprising the area of the Catalan Countries. This view has intense parallels with Basque irredentism and the reunion of all the provinces of the Basque Country (Euskal Herria), covering Álava, Guipúzcoa, Vizcaya and Navarre in Spain, and parts of the “Département des Pyrénées-Atlantiques” in France. The idea of the Catalan Countries has been generally criticized by the Spanish left as “expansionist nationalism,” imperialism, or even racism. 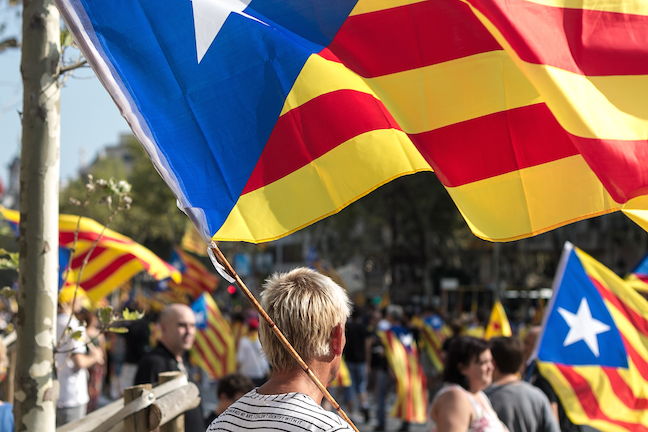 Critics miss a crucial point: the rhetoric of Catalan radical separatism builds on the struggles of national liberation and internationalism, two core tenets of many liberation movements in historical decolonization processes. Indeed, the movement for Basque national liberation was one of the first ones to apply colonial dialectics in the revolutionary socialist project for an independent Basque country. For instance, the works of the Basque nationalist Federico Krutwig, such as Vasconia, were directly inspired by the Algerian National Liberation Front. While the Basque roots of Catalan socialist separatism have been influential in the early beginnings of CUP, the political party has been able to build its own way to socialism. At the center of this socialist project there are three main tenets: the open assembly as the highest expression of participatory democracy, municipalism, and popular unity. Anyone, member or non-member, can attend a CUP assembly. This has been the system developed through the years in order to accommodate diverse political organizations and social movements into what originally began as a mere separatist political platform for Catalan municipal elections. Still today, local assemblies are the main body of power of CUP. In fact, several of these local assemblies had been opposed to running CUP in any other election than the local ones. The national assembly does not override the power of local assemblies: it derives its power from them and their members. The national assembly is open to members, not to delegates. The national secretariat acts as executive committee, with no leadership role defined. Additionally, the CUP constitution has mechanisms to avoid consecutive reelections of committee members or representatives, in order to ensure that no personalism is created. CUP sees municipalism as the basic political foundation for building socialism. Political struggle and autonomy are better expressed in the local framework. In the beginning, the choice to work on the local level was rather instrumentalist and pragmatic: it was the best way to break the ground with a plausible, feasible alternative socialist agenda. Today CUP has 382 elected councilmen and sixteen mayors, including in the third most populated city in Catalonia. A new generation of anonymous leaders has erupted in Catalan politics. The CUP politician (cupaire) is an amateur, not a professional. CUP avoids institutionalized or professionalized politicians, in order to “keep intact democratic and republican values,” as historian and newly elected CUP MP Albert Botran says in his book Unitat Popular . Similarly, CUP hosts a number of independent, non-member candidates, including the future speaker of the party in the next Catalan parliament, journalist Antonio Baños. Where does this local, municipal focus stem from? The construction of popular unity at the local level was a successful instrument before any political representation was achieved. Autonomous self-management was born not only as a necessity but also as an effective model of participatory, alternative economics. CUP still practices this model and avoids big capital donations or corporate money. It is funded by its elected representatives, members, and supporters — plus, now, the public subsides allocated to political parties holding elected representatives. The party keeps strict financial transparency, and makes substantial donations to anti-repressive organizations and alternative economic projects. In the beginning, cooperatives and popular cultural centers (casals and ateneus populars) flourished in the late 1990s and 2000s as safe havens for radical socialist communities, economic alternatives, and ideological formations. Many revolutionary youth organizations were born in these cultural centers. Botran claims that this radical community was instrumental in keeping the separatist movement alive in the difficult years of the early 1990s. In the long term, this radical community became fashionable in mainstream society, and among younger generations. It created a new wave of activists. In addition to the network of popular cultural centers, the emergence of squatted houses — also known as “self-managed social centers” — further extended this radical sensibility in Catalonia. While not all squatted houses are aligned with separatist socialism, some of the most emblematic houses are more identified with the separatist movement, like the squatted house of Can Vies in Barcelona. The idea of Catalan popular unity strives to unite the popular classes with what Freud called “the suppressed,” those who rebel against the scheme of social repression in civilization. CUP is not only a platform for radical parties and organizations, but also represents the seed of transformative, grassroots socialism in Catalonia. Every local assembly represents the essential unit of this popular unity. It represents the neighborhood, the village, the town. Within the socialist-separatist framework, CUP assemblies expect to reach a wide and plural range of people, and thus be real instruments of social power and political transformation. Assemblies are sovereign and potentially powerful. They are the cradle of participatory democracy. In some of the towns where CUP holds the power, these open assemblies have received extra responsibilities and “devolved” powers. And there’s a direct link between these political practices and the history of anarchist and other leftist organization in the region from the Spanish Civil War, and even before that? Ideological plurality and multi-tendency socialism has been enshrined in CUP since its origins. CUP stands for socialism, but does not claim to be the heir of any particular socialist faction or tradition. Catalonia has been a center of social movements during its modern history, from the radical democratic insurrections in the 1830s and 1840s to the anarchist collectivizations of 1936–37. Many ideological tendencies coalesced in CUP. Marxist-Leninist members cooperate with Trotskyists. A libertarian socialist and even anarcho-syndicalist character permeates CUP, in the anti-authoritarian tradition of the Catalan left — embodied by Civil War-era organizations like the Confederación Nacional del Trabajo (CNT), which was anarcho-syndicalist, or Trotskyists like Partido Obrero de Unificación Marxista (POUM). All radical, alternative social and political options are welcome. CUP is hence inclined to maximalist agreements — heated debates have been held in past general assemblies. This does not represent a whitewashing of ideological stances for radical social transformation. To this day, CUP represents the party of “no compromises, disobedience only.” This political intransigence has raised tensions in the separatist milieu, with the other pro-independence, center-right, and center-left parties. So far, CUP has effectively avoided all the calls for union sacrée coalitions or governments. Still, this past aside, the CUP is certainly not a mass force with its level of current support. How does it relate to the other tendencies pushing for Catalan separatism, many with far less progressive inclinations? There seems to be more right-populism than horizontalism at play. Indeed, the call for secession has important neoliberal support in Catalonia, as well as with conservative Catalan nationalists. The acrimony between right and left separatists is vivid and tensions plague the relationship between different separatist forces and CUP. Right populism has been instrumental at some points, especially in rallying the Catalan middle classes. Catalan president Artur Mas has tried to become the essential and only leader of secession, even though he is a recent convert to the idea of independence. Some Spanish analysts have even insinuated that his support for independence is just a Machiavellian strategy for propelling himself into power — though recent legal procedures against him in the Spanish courts contradicts this opinion. In fact, as I have argued in one of my recent op-eds for Diari Ara, it’s as if the historical nineteenth-century fight between Giuseppe Mazzini and Karl Marx in the First International is repeating itself through the tension between Artur Mas and CUP’s Antonio Baños, respectively. Mas, like Mazzini, presents national liberation as an essential democratic exercise in order to make Europe a more democratic continent in which the base would be “cultural nations” instead of “nation-states.” Like Mazzini, inter-classism is religiously preached and the support of the middle classes is actively sought. On the other side, Baños, who defines himself as an “anti-capitalist internationalist” directly calls on the popular classes to struggle against local and international oligarchies and the bourgeoisie. With Baños, the Mazzinian “fraternity of nations” is replaced with the more Marxist, socialist “popular solidarity.” The opposition between CUP and mainstream center-right separatism is clear and definite. The clash will inevitably arrive. What we do not know is when, before or after secession. Specifically, how does CUP plan to engage with Together for Yes, particularly given the influence of right-nationalists like Artur Mas? In the ongoing political negotiations, CUP has been very clear: “no compromises.” CUP does not want to vote for the reelection of Artur Mas as Catalan president and effective leader of the declaration of independence. For Together For Yes, which includes the center-left party Esquerra Republicana de Catalunya (ERC, Republican Left of Catalonia), reelection of Mas is out of discussion. Negotiations between both political forces continue at this moment. CUP is at a crossroads. During the entire campaign, the party has heavily attacked Mas for his spending cuts, neoliberal agenda, and the corruption in his party, Convergència Democràtica de Catalunya (CDC, Democratic Convergence of Catalonia). Many voters trust the ruthless, uncompromising political honesty of CUP. Nonetheless, CUP cannot make a political mistake that might derail Catalan secession. Lots of the focus here seems to be local: on organizing at the municipal level, and through that, encouraging grassroots mobilization. How would even an independent Catalonia with left leadership avoid being derailed by the same continental power structures that Syriza battled with earlier this year? As I said, CUP has few options for a socialist mass transformation. In a hypothetical left leadership, the derailment would be very present. But this would be tied to the derailment of the entire separatist push. There is no secession without CUP. Secession needs the ten MPs in the newly-elected Catalan parliament. The challenge to the continental power structures is at the core of CUP and has been unexpectedly boosted by these same power structures. If Catalonia becomes independent after a unilateral declaration of independence and a radical rupture with Spain, CUP advocates for accepting no part of the Spanish national debt and leaving the European Union, with all its consequences. However, CUP knows that it is not in a position to exert this agenda alone and tries to push these goals in the broad spectrum of the separatist movement. In fact, recent declarations from EU representatives about the real risk of a Catalan exit from the Union has been happily received in the Catalan separatist left, even though center-right separatism supports membership in the EU and the single currency. Major Spanish banks issued a menacing warning to Catalans in which they threatened to leave Catalonia in case of secession. These messages have had the opposite effect they intended: the secessionist momentum has continued to surge and the Catalan left has seen an opportunity for real social and economic liberation from European power structures. Future events will shed light on the role and influence of CUP and the Catalan separatist left in the crucial political act of declaring independence from Spain, which is theoretically expected to happen in the following eighteen months. Boaz Vilallonga teaches Spanish at the Ramaz School and is a visiting scholar at New York University. He is a regular op-ed contributor to the Catalan newspaper Diari Ara .